Photo by Jonathan Schlegel. This file is licensed under the Creative Commons Attribution 3.0 Unported license. As the name suggests, American Foxhounds were originally bred for hunting purposes. These dogs combine immense speed, endurance, and jumping ability with a keen sense of smell and willingness to work in a pack. A protective nature and good-natured disposition means that they are excellent guard dogs and affectionate family pets. Their tremendous energy levels and need for exercise makes them unsuitable for apartment life, however, as they are happiest in open spaces. 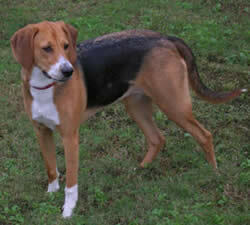 The American Foxhound was first registered by the AKC in 1886 and was one of the earliest breeds to be registered. Its history dates back to the 1650s, when riding to the hounds became a popular pastime of the American upper classes. Originally bred from English Foxhounds, soon French and Irish strains were added to the mix by American breeders. Later, different varieties arose such as the Walker, Trigg, Goodman, July, Calhoun, and Hudspeth. The various strains are divided into two broad categories: running hounds and show hounds. Of these, the running hounds are further divided into two sub-categories: competitive field trial hounds and pack hounds. A good-natured and tolerant breed, these dogs love to be around humans as well as other dogs. They are affectionate and fun loving and make good family pets. However, they tend to be reserved around strangers. These dogs love to explore, so care should be taken not to let them off the leash in large open spaces or strange areas. Living Environment – This is primarily an outdoor breed. Foxhounds traditionally live outside in temperate climates provided there is a warm shelter. However, they are highly sociable and need constant companionship of either the human or animal variety. Their high energy levels require constant activity and make them unsuitable for apartment life. They are happiest in rural landscapes that offer them the freedom to roam and explore. Grooming – The coat of this dog breed is hard and of medium length. They are easy to maintain and require only an occasional brushing to remove hair. Diet & Exercise – This breed requires plenty of exercise on a daily basis. They are best for people who have an active lifestyle, as they love long walks and rambles. They should be let off the leash only in safe, enclosed areas. These dogs have a tendency to gain weight so care should be taken not to overfeed. Health – A hardy breed, these dogs are free of most genetic diseases, although in some cases bleeding disorders, deafness, and spinal problems have been reported. Very independent, the American Foxhound requires a firm hand during dog training. This is especially important, as any doubts of their master’s authority can cause these dogs to act inappropriately protective and aggressive to strangers. House training may also be difficult, so this breed is best with the more experienced dog owner.